Fujitsu combines Japanese innovation with German engineering, which brings you the Fujitsu CELSIUS workstation. Workstations are standard equipment for people who need the highest level of performance from a computer. If it’s CAD, simulation, media/graphic design or architecture, workstations will have enough computing power for your needs. Fujitsu workstations are reliable, performance orientated and expandable. They are all ISV (independent software vendor) certified and designed for 24/7 continuous operation. They have server class technology along with error correcting code and long life-cycles (3 years). 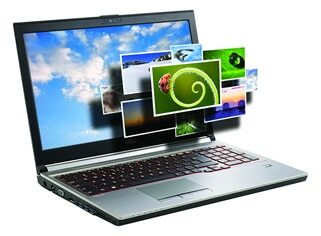 They have a complete range of solutions from laptops/desktops/VDI and rack workstations. All of the CELSIUS workstations have optimized thermal management, and an “air tunnel” type flow, which results in them cooling efficiently and being available for continuous use. Believe it or not, all their workstations run between 18 and 23 decibels (even under full workload), which is quieter than a library so makes for a pleasant working environment. The BIOS for all workstations is developed in house at Fujitsu’s factory in Augsburg, Germany. They also carry out comprehensive testing here, to make sure the workstations are to the highest degree of production. These tests include: Vibration test, where the reliability and durability of the disk drives, both operating and non-operating tests. Electromagnetic compatibility test which ensures that the components are running properly and to see make sure they do not interfere with any other products and so they do not affect any other products. They also test with the Noise test and ensure the systems have the lowest noise emissions of any other systems which allows for a quiet working environment. If some of your employees have varied workloads, then these may be the best option. They can be rack mounted and are capable of remote login, so can be accessed from anywhere using the FUTRO thin clients or a laptop. They provide the power of a workstation, but are more compact and easily manageable. For example, an engineer has his data on the rack workstation, but is on site elsewhere, he can login to this workstation to access his data, providing him with better productivity. They could also be used for in schools, placed in the server room and again used for remote login saves up space and stops the workstations from being broken. Fujitsu workstations are based on server class hardware, and support processors from the highest speed category and in some cases, 2 processors rather than 1. These being Intel Xeon, which are single and dual processors and up to 2×18 cores at a frequency of 3.7 GHz. They also generally use DDR4 memory, compared to desktop PC’s that use DDR3. Workstations also use SAS drives, which are more reliable, support better access times and run at 15k rpm, compared to Desktops which use SATA III, which is a lot slower and less reliable. Workstations are easily expandable with a tool free chassis, for ease of access. They support special high end graphic cards which are specifically designed for the respective applications. If you find yourself on the move a lot and are looking for a portable, lightweight and compact mobile workstation that combines powerful performance with multiple connectivity options. The CELSIUS H730 has a 15.6” screen, weighs 2.75kg and has up to 14 hours runtime (continuous). It has the best in class security, with Fujitsu’s PalmSecure, which reads your vein pattern in your hand to unlock the device, as there is no contact with the sensor it is completely hygienic. It works by capturing a person’s vein pattern whilst emitting near infrared rays, which the deoxidised haemoglobin in the veins absorb the rays. They vein pattern is verified against a pattern that already exists. The mobile workstation can still feature a number of high end processors, like Intel’s i7-4910MQ which has 8MB of cache and can run at a speed of 2.9 GHz up to 3.9 GHz. It can also support up to 32GB of memory, so you can run a fair few applications at once. The H730 supports SATA III HDD’s and SSD’s. The housing is made out of magnesium, has LED backlit and an anti-glare display. Desktop PCs are mainly suited for home offices, or small business users. Mainly used for browsing the internet, playing media files, connecting with family/friends and email. They can run basic office programmes like databases, spreadsheets word processors and internet applications easily. On the other hand, workstations are used by scientists, engineers, architects and media/digital content creators, so require a lot more powerful machines to run the apps used (CAD, simulations, and rendering/graphical design). Where the components in a desktop PC are pretty standardized for family/home business use, workstation components have been specially selected, making sure the applications are optimized for the system. Although most desktops have multi core processors, workstations come with more cores per CPU and generally supports multiple processors for parallel processing power. Workstations, unlike desktops are built from the ground up so you can upgrade or add more components, whereas desktops usually have integrated graphics, network interfaces and hard drive controllers all built into the motherboard and have near to no room for upgrades and the chassis being compact. Where a workstation has enterprise drives, and a desktop has desktop drives. WS can run 24/7 continuously, and a desktop is more suited for 8 hours a day then turned off. They are not subject to the same strenuous testing that the workstations are. If you want a computer than is expandable, powerful and future proof then a Fujitsu workstation is for you.